The border between Tennessee and North Carolina runs northeast to southwest through the centerline of the Smoky Mountains National Park. It is the most visited national park in the United States. We first visited this national park in 1997, and even though this month marked our second visit, we found quite a bit of new spots to explore. They don’t call them the Smoky Mountains for no reason. Photo by CCPerez. Copyright © April, 2007 Connie Perez. All rights reserved. The park has over 900 miles of hiking trails for any level of hiker. Many of the hikes pass or end at cascading waterfalls and scenic vistas. A wide range of easy day hikes can be found throughout the park. The Appalachian Trail runs through the park and crosses many of the park trails. Aside from the hundreds of miles of hiking trails, mountain drives and breathtaking views, there’s a chance that you may get to see a bear or any number of other interesting wild creatures. Iced rocks. In month of March. Surrounding towns include Gatlinburg, Pigeon Forge, Sevierville, and Townsend, Tennessee; and Cherokee, Sylva, Maggie Valley, and Bryson City, North Carolina. Beautiful and comfortable cabins near the entrance of the park. One of the hardest things to accomplish for ourselves is self acceptance. Rarely is anyone able to accept themselves fully, with all the good and the bad. Yet, time and again, we hear that in order to be able to accept, like, forgive and love others, we must first learn to accept, like, forgive and love ourselves. For attractive lips, speak words of kindness..
For poise, walk with the knowledge that you never walk alone..
As most of you know, tomorrow marks the beginning of Lent. As we prepare ourselves to embark on this journey, we are to be reminded that Lent can sometimes faintly tempt us to act falsely and then feel good about it. Like telling ourselves that if we measure ourselves by eating and drinking moderately during Lent, then maybe we don’t really have to measure ourselves in the same way at other times; if we avoid getting into arguments with a certain person during Lent, then maybe it doesn’t matter what we say to that person at other times; or that if we help the needy during Lent, then maybe we don’t really have to service others the rest of the time. Because after all, we did the right thing during Lent. If we’re not careful and let this happen, Lent could sometimes lead us not toward but away from God. Let’s make sure that during this Lent season our prayer, fasting and works of mercy are genuine. And pray that these genuine acts that come from the heart become a constant practice in our lives. Edward Estlin Cummings (October 14, 1894 – September 3, 1962), born in Cambridge, Massachusetts. Interesting tidbit: His poem “if there are any heavens” was read at his mother’s funeral. In it, he paints a picture to the reader of his father waiting in heaven for his mother. It is said that Cummins loved his parents and had a sense of closure knowing that with his mother’s death, the two were finally together. if there are any heavens my mother will(all by herself)have one. What is God’s role in your life? Where do you place Him in your list of priorities? Sometimes it’s a bit difficult to keep God at the center of our lives, trust me, I know. With all the distractions, hecticness, etc. But as sure as I’m breathing right this minute, I tell you we must keep Him front and center in our lives. to the moon by astronaut James B. Irwin on Apollo 15.
left a copy of the poem on the moon. Here’s a list of books I recommend (most current read on top). You can click on the links to read about them. I thought I’d share with you some interesting information, gathered from various sources, about this remarkable woman who made such a huge difference in so many people’s lives. Below you will find a bit on her background, her Nobel Peace Prize acceptance speech, her brief to the U.S. Supreme Court regarding abortion, a short explanation on her canonization process, some of her quotations, and a neat PowerPoint presentation on her life. I hope it all helps you appreciate the kind of person she was…and the kind of saint she is. Mother Teresa was always her own person, startlingly independent, obedient, yet challenging some preconceived notions and expectations. Her own life story includes many illustrations of her willingness to listen to and follow her own conscience, even when it seemed to contradict what was expected. This strong and independent Slavic woman was born Gonxha (Agnes) Bojaxhiu in Skopje, Yugoslavia, on August 27, 1910. Five children were born to Nikola and Dronda Bojaxhiu, yet only three survived. Gonxha was the youngest, with an older sister, Aga, and brother, Lazar. This brother describes the family’s early years as well-off, not the life of peasants reported inaccurately by some. We lacked for nothing. In fact, the family lived in one of the two houses they owned. Nikola was a contractor, working with a partner in a successful construction business. He was also heavily involved in the politics of the day. Lazar tells of his father’s rather sudden and shocking death, which may have been due to poisoning because of his political involvement. With this event, life changed overnight as their mother assumed total responsibility for the family, Aga, only 14, Lazar, 9, and Gonxha, 7. Though so much of her young life was centered in the Church, Mother Teresa later revealed that until she reached 18, she had never thought of being a nun. During her early years, however, she was fascinated with stories of missionary life and service. She could locate any number of missions on the map, and tell others of the service being given in each place. Called to Religious Life At 18, Gonxha decided to follow the path that seems to have been unconsciously unfolding throughout her life. She chose the Loreto Sisters of Dublin, missionaries and educators founded in the 17th century to educate young girls. In 1928, the future Mother Teresa began her religious life in Ireland, far from her family and the life she’d known, never seeing her mother again in this life, speaking a language few understood. During this period a sister novice remembered her as very small, quiet and shy, and another member of the congregation described her as ordinary. Mother Teresa herself, even with the later decision to begin her own community of religious, continued to value her beginnings with the Loreto sisters and to maintain close ties. Unwavering commitment and self-discipline, always a part of her life and reinforced in her association with the Loreto sisters, seemed to stay with her throughout her life. One year later, in 1929, Gonxha was sent to Darjeeling to the novitiate of the Sisters of Loreto. In 1931, she made her first vows there, choosing the name of Teresa, honoring both saints of the same name, Teresa of Avila and Therese of Lisieux. In keeping with the usual procedures of the congregation and her deepest desires, it was time for the new Sister Teresa to begin her years of service to God’s people. She was sent to St. Mary’s, a high school for girls in a district of Calcutta. Here she began a career teaching history and geography, which she reportedly did with dedication and enjoyment for the next 15 years. It was in the protected environment of this school for the daughters of the wealthy that Teresa’s new vocation developed and grew. This was the clear message, the invitation to her second calling, that Teresa heard on that fateful day in 1946 when she traveled to Darjeeling for retreat. The Streets of Calcutta During the next two years, Teresa pursued every avenue to follow what she never doubted was the direction God was pointing her. She was to give up even Loreto where I was very happy and to go out in the streets. I heard the call to give up all and follow Christ into the slums to serve him among the poorest of the poor. Technicalities and practicalities abounded. She had to be released formally, not from her perpetual vows, but from living within the convents of the Sisters of Loreto. She had to confront the Church’s resistance to forming new religious communities, and receive permission from the Archbishop of Calcutta to serve the poor openly on the streets. She had to figure out how to live and work on the streets, without the safety and comfort of the convent. As for clothing, Teresa decided she would set aside the habit she had worn during her years as a Loreto sister and wear the ordinary dress of an Indian woman: a plain white sari and sandals. Teresa first went to Patna for a few months to prepare for her future work by taking a nursing course. In 1948 she received permission from Pius XII to leave her community and live as an independent nun. So back to Calcutta she went and found a small hovel to rent to begin her new undertaking. Wisely, she thought to start by teaching the children of the slums, an endeavor she knew well. Though she had no proper equipment, she made use of what was available—writing in the dirt. She strove to make the children of the poor literate, to teach them basic hygiene. As they grew to know her, she gradually began visiting the poor and ill in their families and others all crowded together in the surrounding squalid shacks, inquiring about their needs. Teresa found a never-ending stream of human needs in the poor she met, and frequently was exhausted. Despite the weariness of her days she never omitted her prayer, finding it the source of support, strength and blessing for all her ministry. A Movement Begins Teresa was not alone for long. Within a year, she found more help than she anticipated. Many seemed to have been waiting for her example to open their own floodgates of charity and compassion. Young women came to volunteer their services and later became the core of her Missionaries of Charity. Others offered food, clothing, the use of buildings, medical supplies and money. As support and assistance mushroomed, more and more services became possible to huge numbers of suffering people. From their birth in Calcutta, nourished by the faith, compassion and commitment of Mother Teresa, the Missionaries of Charity have grown like the mustard seed of the Scriptures. New vocations continue to come from all parts of the world, serving those in great need wherever they are found. Homes for the dying, refuges for the care and teaching of orphans and abandoned children, treatment centers and hospitals for those suffering from leprosy, centers and refuges for alcoholics, the aged and street people—the list is endless. Until her death in 1997, Mother Teresa continued her work among the poorest of the poor, depending on God for all of her needs. Honors too numerous to mention had come her way throughout the years, as the world stood astounded by her care for those usually deemed of little value. In her own eyes she was God’s pencil—a tiny bit of pencil with which he writes what he likes. Despite years of strenuous physical, emotional and spiritual work, Mother Teresa seemed unstoppable. Though frail and bent, with numerous ailments, she always returned to her work, to those who received her compassionate care for more than 50 years. Only months before her death, when she became too weak to manage the administrative work, she relinquished the position of head of her Missionaries of Charity. She knew the work would go on. Finally, on September 5, 1997, after finishing her dinner and prayers, her weakened heart gave her back to the God who was the very center of her life. “As we have gathered here together to thank God for the Nobel Peace Prize I think it will be beautiful that we pray the prayer of St. Francis of Assisi which always surprises me very much — we pray this prayer every day after Holy Communion, because it is very fitting for each one of us, and I always wonder that 4-500 years ago as St. Francis of Assisi composed this prayer that they had the same difficulties that we have today, as we compose this prayer that fits very nicely for us also. I think some of you already have got it — so we will pray together. Let us thank God for the opportunity that we all have together today, for this gift of peace that reminds us that we have been created to live that peace, and Jesus became man to bring that good news to the poor. He being God became man in all things like us except sin, and he proclaimed very clearly that he had come to give the good news. The news was peace to all of good will and this is something that we all want — the peace of heart — and God loved the world so much that he gave his son — it was a giving — it is as much as if to say it hurt God to give, because he loved the world so much that he gave his son, and he gave him to Virgin Mary, and what did she do with him? As soon as he came in her life — immediately she went in haste to give that good news, and as she came into the house of her cousin, the child — the unborn child — the child in the womb of Elizabeth, leapt with joy. He was that little unborn child, was the first messenger of peace. He recognised the Prince of Peace, he recognised that Christ has come to bring the good news for you and for me. And as if that was not enough — it was not enough to become a man — he died on the cross to show that greater love, and he died for you and for me and for that leper and for that man dying of hunger and that naked person lying in the street not only of Calcutta, but of Africa, and New York, and London, and Oslo — and insisted that we love one another as he loves each one of us. And we read that in the Gospel very clearly — love as I have loved you — as I love you — as the Father has loved me, I love you — and the harder the Father loved him, he gave him to us, and how much we love one another, we, too, must give each other until it hurts. It is not enough for us to say: I love God, but I do not love my neighbour. St. John says you are a liar if you say you love God and you don’t love your neighbour. How can you love God whom you do not see, if you do not love your neighbour whom you see, whom you touch, with whom you live. And so this is very important for us to realise that love, to be true, has to hurt. It hurt Jesus to love us, it hurt him. And to make sure we remember his great love he made himself the bread of life to satisfy our hunger for his love. Our hunger for God, because we have been created for that love. We have been created in his image. We have been created to love and be loved, and then he has become man to make it possible for us to love as he loved us. He makes himself the hungry one — the naked one — the homeless one — the sick one — the one in prison — the lonely one — the unwanted one — and he says: You did it to me. Hungry for our love, and this is the hunger of our poor people. This is the hunger that you and I must find, it may be in our own home. I was surprised in the West to see so many young boys and girls given into drugs, and I tried to find out why — why is it like that, and the answer was: Because there is no one in the family to receive them. Father and mother are so busy they have no time. Young parents are in some institution and the child takes back to the street and gets involved in something. We are talking of peace. These are things that break peace, but I feel the greatest destroyer of peace today is abortion, because it is a direct war, a direct killing — direct murder by the mother herself. And we read in the Scripture, for God says very clearly: Even if a mother could forget her child — I will not forget you — I have carved you in the palm of my hand. We are carved in the palm of His hand, so close to Him that unborn child has been carved in the hand of God. And that is what strikes me most, the beginning of that sentence, that even if a mother could forget something impossible — but even if she could forget — I will not forget you. And today the greatest means — the greatest destroyer of peace is abortion. And we who are standing here — our parents wanted us. We would not be here if our parents would do that to us. Our children, we want them, we love them, but what of the millions. Many people are very, very concerned with the children in India, with the children in Africa where quite a number die, maybe of malnutrition, of hunger and so on, but millions are dying deliberately by the will of the mother. And this is what is the greatest destroyer of peace today. Because if a mother can kill her own child — what is left for me to kill you and you kill me — there is nothing between. And this I appeal in India, I appeal everywhere: Let us bring the child back, and this year being the child’s year: What have we done for the child? At the beginning of the year I told, I spoke everywhere and I said: Let us make this year that we make every single child born, and unborn, wanted. And today is the end of the year, have we really made the children wanted? I will give you something terrifying. We are fighting abortion by adoption, we have saved thousands of lives, we have sent words to all the clinics, to the hospitals, police stations — please don’t destroy the child, we will take the child. So every hour of the day and night it is always somebody, we have quite a number of unwedded mothers — tell them come, we will take care of you, we will take the child from you, and we will get a home for the child. And we have a tremendous demand from families who have no children, that is the blessing of God for us. And also, we are doing another thing which is very beautiful — we are teaching our beggars, our leprosy patients, our slum dwellers, our people of the street, natural family planning. The poor people are very great people. They can teach us so many beautiful things. The other day one of them came to thank and said: You people who have vowed chastity you are the best people to teach us family planning. Because it is nothing more than self-control out of love for each other. And I think they said a beautiful sentence. And these are people who maybe have nothing to eat, maybe they have not a home where to live, but they are great people.The poor are very wonderful people. One evening we went out and we picked up four people from the street. And one of them was in a most terrible condition — and I told the Sisters: You take care of the other three, I take of this one that looked worse. So I did for her all that my love can do. I put her in bed, and there was such a beautiful smile on her face. She took hold of my hand, as she said one word only: Thank you — and she died. I could not help but examine my conscience before her, and I asked what would I say if I was in her place. And my answer was very simple. I would have tried to draw a little attention to myself, I would have said I am hungry, that I am dying, I am cold, I am in pain, or something, but she gave me much more — she gave me her grateful love. And she died with a smile on her face. As that man whom we picked up from the drain, half eaten with worms, and we brought him to the home. I have lived like an animal in the street, but I am going to die like an angel, loved and cared for. And it was so wonderful to see the greatness of that man who could speak like that, who could die like that without blaming anybody, without cursing anybody, without comparing anything. Like an angel — this is the greatness of our people. And that is why we believe what Jesus had said: I was hungry — I was naked — I was homeless — I was unwanted, unloved, uncared for — and you did it to me. There is so much suffering, so much hatred, so much misery, and we with our prayer, with our sacrifice are beginning at home. Love begins at home, and it is not how much we do, but how much love we put in the action that we do. It is to God Almighty — how much we do it does not matter, because He is infinite, but how much love we put in that action. How much we do to Him in the person that we are serving. And so here I am talking with you — I want you to find the poor here, right in your own home first. And begin love there. Be that good news to your own people. And find out about your next-door neighbour — do you know who they are? I had the most extraordinary experience with a Hindu family who had eight children. A gentleman came to our house and said: Mother Teresa, there is a family with eight children, they had not eaten for so long — do something. So I took some rice and I went there immediately. And I saw the children — their eyes shinning with hunger — I don’t know if you have ever seen hunger. But I have seen it very often. And she took the rice, she divided the rice, and she went out. When she came back I asked her — where did you go, what did you do? And she gave me a very simple answer: They are hungry also. What struck me most was that she knew — and who are they, a Muslim family — and she knew. I didn’t bring more rice that evening because I wanted them to enjoy the joy of sharing. But there were those children, radiating joy, sharing the joy with their mother because she had the love to give. And you see this is where love begins — at home. And I want you — and I am very grateful for what I have received. It has been a tremendous experience and I go back to India — I will be back by next week, the 15th I hope — and I will be able to bring your love. To be able to do this, our Sisters, our lives have to be woven with prayer. They have to be woven with Christ to be able to understand, to be able to share. Because today there is so much suffering — and I feel that the passion of Christ is being relived all over again — are we there to share that passion, to share that suffering of people. Around the world, not only in the poor countries, but I found the poverty of the West so much more difficult to remove. When I pick up a person from the street, hungry, I give him a plate of rice, a piece of bread, I have satisfied. I have removed that hunger. But a person that is shut out, that feels unwanted, unloved, terrified, the person that has been thrown out from society — that poverty is so hurtable and so much, and I find that very difficult. Our Sisters are working amongst that kind of people in the West. So you must pray for us that we may be able to be that good news, but we cannot do that without you, you have to do that here in your country. You must come to know the poor, maybe our people here have material things, everything, but I think that if we all look into our own homes, how difficult we find it sometimes to smile at each, other, and that the smile is the beginning of love. The other day I received 15 dollars from a man who has been on his back for twenty years, and the only part that he can move is his right hand. And the only companion that he enjoys is smoking. And he said to me: I do not smoke for one week, and I send you this money. It must have been a terrible sacrifice for him, but see how beautiful, how he shared, and with that money I bought bread and I gave to those who are hungry with a joy on both sides, he was giving and the poor were receiving. This is something that you and I — it is a gift of God to us to be able to share our love with others. And let it be as it was for Jesus. Let us love one another as he loved us. Let us love Him with undivided love. And the joy of loving Him and each other — let us give now — that Christmas is coming so close. Let us keep that joy of loving Jesus in our hearts. And share that joy with all that we come in touch with. And that radiating joy is real, for we have no reason not to be happy because we have no Christ with us. Christ in our hearts, Christ in the poor that we meet, Christ in the smile that we give and the smile that we receive. Let us make that one point: That no child will be unwanted, and also that we meet each other always with a smile, especially when it is difficult to smile. THE STATE oF NEw JERSEY, Respondent. Mother Teresa resides at 54 1A Ach. Jagdish, Ch. Bose Rd., Calcutta, India 700 016. She is the founder and mother superior of the Order of the Missionaries of Charity. The order maintains its headquarters in Calcutta, India. The Missionaries of Charity have provided services to the needy in many parts of the world, including the United States of America, where the order’s main office is located at 335 East 145th Street in the Bronx, New York. Much of the work of the Missionaries of Charity involves providing charitable services to children and to poor families. Through this work Mother Teresa and the Missionaries of Charity have a special interest in the welfare of all children, born and unborn, and the familial relationship between children and their mothers and fathers. The unborn child possesses an inalienable right to life which must be recognized and safeguarded by any just society. 1. THE QUESTION WHETHER UNBORN HUMAN BEINGS POSSESS THE INALIENABLE RIGHT TO LIFE IS OF THE GREATEST IMPORTANCE AND MUST NOT BE AVOIDED BY THE COURT. I hope you will count it no presumption that I seek your leave to address you on behalf of the unborn child. Like that child I can be called an outsider. I am not an American citizen. My parents were Albanian. I was born before the First World War in a part of what was not yet, and is no longer, Yuglosavia. In many senses I know what it is like to be without a country. I also know what it is like to feel an adopted citizen of other lands. When I was still a girl I travelled to India. I found my work among the poor and sick of that nation, and I have lived there ever since. Since 1950 I have worked with my many sisters from around the world as one of the Missionaries of Charity. Our congregation now has over 400 foundations in more than 100 countries, including the United States of America. We have almost 5,000 sisters. We care for those who are often treated as outsiders in their own communities by their own neighbors-the starving, the crippled, the impoverished, and the diseased, from the old woman with a brain tumor in Calcutta to the young man with AIDS in New York City. A special focus of our care are mothers and their children. This includes mothers who feel pressured to sacrifice their unborn children by want, neglect, despair, and philosophies and governmental policies which promote the dehumanization of inconvenient human life. And it includes the.children themselves, innocent and utterly defenseless, who are at the mercy of those who would deny their humanity. So, in a sense, my sisters and those we serve are all outsiders together. At the same time, we are supremely conscious of the common bonds of humanity that unite us and transcend national boundaries. We hold these truths to be self-evident: that all men are created equal; that they are endowed by their creator with certain inalienable rights; that among these are life, liberty, and the pursuit of happiness …. It must be recognized that your model was never one of realized perfection, but of ceaseless aspiration. From the outset, for example, America denied the African slave his freedom and human dignity. But in time you righted that wrong, albeit at an incalculable cost in human suffering and loss of life. Your impetus has almost always been toward a fuller, more all-embracing conception and assurance of the rights which your founding fathers recognized as inherent and God-given. Yours has ever been an inclusive, not an exclusive society. And your steps, though they may have paused or faltered now and then, have been pointed in the right direction and have trod the right path. The task has not always been an easy one, and each new generation has faced its own challenges and tempations. But, in a uniquely courageous and inspiring way, America has kept faith. Yet there has been one infinitely tragic and destructive departure from those American ideals in recent memory. It was this Court’s own decision in 1973 to exclude the unborn child from the human family. Roe v. Wade, 410 U.S. 113 (1973). You ruled that a mother, in consulation with her doctor, has broad discretion, guaranteed against infringement by the United States Constitution, to choose to destroy her unborn child. Your opinion stated that you did not need to “resolve the difficult question of when life begins.” 410 U.S. at 159. That question is inescapable. If the right life is an inherent and inalienable right, it must surely obtain wherever human life exists. No one can deny that the unborn child is a distinct human being, that it is human, and that it is alive. It is unjust, therefore, to deprive the unborn child of its fundamental right to life on the basis of its age, size, or condition of dependency. It was a sad infidelity to America’s highest ideals when this Court said it did not matter, or could not be determined, when the inalienable right to life began for a child in its mother’s womb. America needs no words from me to see how your decision in Roe v. Wade has deformed a great nation. The so-called right to abortion has pitted mothers against their children and women against men. It has sown violence and discord at the heart of the most intimate human relationships. It has aggravated the derogation of the father’s role in an increasingly fatherless society. It has portrayed the greatest of gifts-a child-as a competitor, an intrusion, and an inconvenience. It has nominally accorded mothers unfettered dominion over the independent lives of their physically dependent sons and daughters. And, in granting this unconscionable power, it has exposed many women to unjust and selfish demands from their husbands or other sexual partners. The unborn child is entitled to its right to life independently of acceptance by its mother; this is an elementary and inalienable right which emanates from the dignity of the human being. Americans may feel justly proud that Germany in 1993 was able to recognize the sanctity of human life. You must weep that your own government, at present, seems blind to this truth. I have no new teaching for America. I seek only to recall you to faithfulness to what you once taught the world. Your nation was founded on the propositionvery old as a moral precept, but startling and innovative as a political insight-that human life is a gift of immeasurable worth, and that it deserves, always and everywhere, to be treated with the utmost dignity and respect. I urge the Court to take the opportunity presented by the petitions in these cases to consider the fundamental question of when human life begins and to declare without equivocation the inalienable rights which it possesses. William C. Porth, Jr., Esq. Following Mother Teresa’s death in 1997, the Holy See began the process of beautification, the second step towards possible canonization. This process requires the documentation of a miracle performed from the intercession of Mother Teresa. In 2002, the Vatican recognized as a miracle the healing of a tumor in the abdomen of an Indian woman, Monica Besra, following the application of a locket containing Mother Teresa’s picture. Monica Besra said that a beam of light emanated from the picture, curing the cancerous tumor. It is claimed that some of Besra’s medical staff and, initially, Besra’s husband insisted that conventional medical treatment eradicated the tumor. An opposing perspective of the claim is that Monica’s medical records contain sonograms, prescriptions, and physicians’ notes that could conceivably prove whether the cure was a miracle or not. Monica has claimed Sister Betta of the Missionaries of Charity is holding them. The publication has received a “no comments” statement from Sister Betta. The officials at the Balurghat Hospital where Monica was seeking medical treatment are claiming that they are being pressured by the Catholic order to declare the cure as a miracle. Christopher Hitchens was the only witness called by the Vatican to give evidence against Mother Teresa’s beautification and canonization process, as the Vatican had abolished the traditional “devil’s advocate” role, which fulfilled a similar purpose. Hitchens has argued that “her intention was not to help people”, and he alleged that she lied to donors about the use of their contributions. “It was by talking to her that I discovered, and she assured me, that she wasn’t working to alleviate poverty,” says Hitchens. “She was working to expand the number of Catholics. She said, ‘I’m not a social worker. I don’t do it for this reason. I do it for Christ. I do it for the church.’” In the process of examining Teresa’s suitability for beatification and canonization, the Roman Curia (the Vatican) pored over a great deal of documentation of published and unpublished criticisms against her life and work. Vatican officials say Hitchens’ allegations have been investigated by the agency charged with such matters, the Congregation for the Causes of Saints, and they found no obstacle to Mother Teresa’s beatification. Due to the attacks she has received, some Catholic writers have called her a sign of contradiction. 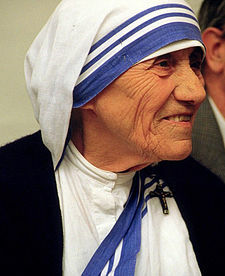 The beatification of Mother Teresa took place on October 19, 2003, thereby bestowing on her the title “Blessed.” Unless dispensed by the Pope, a second miracle is required for her to proceed to canonization. “I see God in every human being. When I wash the leper’s wounds, I feel I am nursing the Lord himself. Is it not a beautiful experience?” — 1974 interview. “When I see waste here, I feel angry on the inside. I don’t approve of myself getting angry. But it’s something you can’t help after seeing Ethiopia.” — Washington 1984. “I choose the poverty of our poor people. But I am grateful to receive (the Nobel) in the name of the hungry, the naked, the homeless, of the crippled, of the blind, of the lepers, of all those people who feel unwanted, unloved, uncared-for throughout society, people that have become a burden to the society and are shunned by everyone.” — Accepting the Nobel Peace Prize, 1979. “God will find another person, more humble, more devoted, more obedient to him, and the society will go on.” — Calcutta 1989, after announcing her intention to retire. “I was expecting to be free, but God has his own plans.” — Calcutta 1990, when the sisters of her order persuaded her to withdraw her resignation. “I have never been in a war before, but I have seen famine and death. I was asking (myself), ‘What do they feel when they do this?’ I don’t understand it. They are all children of God. Why do they do it? I don’t understand.” — Beirut 1982, during fighting between the Israeli army and Palestinian guerrillas. “Please choose the way of peace. … In the short term there may be winners and losers in this war that we all dread. But that never can, nor never will justify the suffering, pain and loss of life your weapons will cause.” — Letter to U.S. President George Bush and Iraqi President Saddam Hussein, January 1991. “The other day I dreamed that I was at the gates of heaven. And St. Peter said, ‘Go back to Earth. There are no slums up here. '” — Quoted as telling Prince Michael of Greece in 1996. In the end, dear friend, it is always between us and God, not between us and them. This entry is under construction. Check back again soon for complete post. California is home to, among others, Yosemite National Park, which is famous for its granite domes, to Sequoia and Kings Canyon National Parks, where you’ll see some of the world’s largest trees, and to Death Valley National Park, home of the hottest and lowest place found in the Western hemisphere. When we first visited Yosemite and Sequoia in 2000, we did not take the drive to Death Valley. It wasn’t until our trip last month when we returned to Nevada, Arizona and Utah that we ventured across into California and got to visit that incredible park. It was a detour too close to pass up. And it was totally worth it. Yosemite National Park is is located in the central Sierra Nevada of California. It takes approximately 3.5 hours to drive to the park from San Francisco and approximately 6 hours from Los Angeles. Yosemite Valley represents only one percent of the park area, but this is where most visitors arrive and stay. Here is where you find one of the most popular rock climbing destinations in the world, El Capitan, a prominent granite cliff that looms over the valley, along with granite domes such as Sentinel Rock and Half Dome, which rise 3,000 feet and 4,800 feet, respectively, above the valley floor. You’ll also find many powerful waterfalls, including three of the world’s highest. Sequoia and Kings Canyon National Parks are administered together. Their main attraction are its giant trees. And most of them can be found in the heart of Sequoia, the Giant Forest. It is there that you’ll find the General Sherman, the largest living thing on Earth. The tree weighs over 2,000 tons, has bark up to 3 feet thick and is 272 feet high. But the majority of these national parks protects a large part of the Sierra Nevada range with canyons, lakes, waterfalls and high mountains, including Mount Whitney, the highest peak in the contiguous United States. Photo by CCPerez. Copyright © July, 2006 Connie Perez. All rights reserved. Death Valley National Park is a desert. It is the lowest, driest and hottest valley in the United States. It is also the location of the lowest elevation in North America at Badwater, which is 282 feet below sea level. It holds the record for the highest reliably reported temperature in the Western hemisphere – 134 °F. But despite its reputation, this is a place of amazing beauty with many colorful rocks and canyons, miles of pristine sand dunes, unique evaporative salt features and even a diverse range of wildlife. It is by far the wildest place I’ve ever visited. One of my favorite things to do when I was a kid (aside from playing catch with my dad…that’s right) was to play with puzzles. All kinds of puzzles, crossword puzzles, jigsaw puzzles, logic puzzles. I liked searching for the answers or fitting the pieces together, and loved the satisfying feeling of solving them or seeing the whole picture complete. Of course, patience was paramount and it helped that I was born with plenty of it. Puzzles are still one of my favorite past times. Today, however, aside from the usual ones, I often catch myself trying to solve a different kind: the puzzle that life is — purpose. I say catch myself because it’s usually not intentional (although it should be). It’s just that sometimes, as you know, certain things happen which leave us scratching our heads and saying…humm. That’s usually what prompts the 5 W’s to invade my mind, becoming the edge pieces needed to start my “purpose” puzzles with: who, what, when, where, and why. That’s me, and I know that’s some of you, most of the time. Still, other times we choose not to bother with this purpose thing. Takes too much thinking. Plus we believe there is a Higher Plan for us and we think such will unfold itself one way or the other no matter what our actions, leaving us responsibility-free. But that would be the easy way though, and if we understand that Christianity is sometimes taking the road less traveled, responsibility then should be, among others, the main reason why we should try to figure out purpose. Once we have gone through the process of piecing together some of these puzzles, we come to recognize that the other reasons for doing so are beneficial to us and can turn out to make quite a difference. Can it, though, and how, if the Plan is written, edged in stone, His will be done, etc., etc., etc.? Well, one thing I have come to believe is that for the most part the purpose of God’s design for us is not so much in what occurs but in how we deal with what occurs. It’s about this: circumstances + choices + free will = consequences. God presents us with circumstances. For each circumstance – a set of choices, giving us free will of course, and for each choice we make – consequences. Whenever I look back through the workings of this cycle after certain trying things have happened in my life, I have almost always been able to see how I got to where I was at that time and how God gave me the strength and courage to make it through many of those times. That alone, at the very least, if nothing more, is worth the trouble of working out a purpose puzzle. Sure, even at first glance, the word “purpose” itself can feel massive and complex, and the thought of it intimidating. Quite the challenge. But purpose differs in extent and it’s not always so difficult to decipher. We all have what sometimes seem insignificant and coincidental experiences, what some of us call God winks. Like spotting a tiny little lizard in the room where you had been packing your bags for a flight you’re catching early next morning which prompt you to close the bags at which time you discover one of the bags has the zipper completely out of commission which sends you to the store at the eleventh hour to buy a new bag…imagine the predicament minutes before rushing out to the airport should you have not encountered that lizard the night before. That was last July and that’s my lizard purpose story. I know most of you have your own God wink stories. Coinkidinks as my daughter calls them. But I’m sure most of you would agree that the most significant purpose stories in our lives involve people. Those in and out of our lives for a season, a reason or a lifetime, as they say. Whether family or not, all chosen for us nonetheless. Some to help us, others to mess with us, but all to test us. And it is in the process of reflecting and working on figuring out our purpose puzzles that we realize how we are used as God’s instruments, according to the gifts and talents He has given us. And that we have a responsibility to make ourselves accountable to each other. An act that can help save us from falling into the hands of the enemy. An enemy who never misses a chance to come knocking at our door (otherwise we might open without even looking through the peephole). We all have a role to play in this Master plan, and how we react to and deal with circumstances can be an example to others. Second major reason for looking into this purpose deal. When I think about the people in my life and the intertwining roles we play in each other’s lives I’m often able to come up with lessons, whether learned or not, that came from most of the experiences and how they have affected me. Teaching me, preparing me and molding me into the person I am today. From every family member, every friend and every acquaintance, to the homeless guy who reaches out to you some mornings at the Cafe window. All divine connections. Their objectives precisely timed, since once purpose has been served, we are often asked to move on. And move on we must. Easier for some than for others (myself one of these others). This is where those of us who don’t do well with change get stuck. Yet, we must be appreciative of all of our experiences no matter how difficult or painful they sometimes are. The process of reflection and of reading between the lines of God’s Plan can help sharpen our sight and make our calling a bit clearer for us to follow. It can also help us reach realization and acceptance. This acceptance allows us, wherever called for, to break down those walls of pride and resentment, and to forgive; and this forgiveness, allows us to move on. Ultimately it can all serve to get us into the right place allowing us to better deal with things. le to see the reasons for the things we must go through, the incidents and the people we are wondering about at the time, and we often become frustrated when the picture is not clear right away. That alone can be trying and affect us physically and emotionally. Not to mention what it does to our faith. This is usually where I find myself Mary Popping my way through this phase of the puzzle…with a spoonful of sugar. Why it is essential that we go about this puzzling business patiently, listening for God’s whispers, stepping back and looking from afar. Because the closer you get or you are the less you can see (sort of like my eyesight lately). But when realization hits and the pieces start lining up, it can be quite liberating…Next!…. How sweet that is. Time and the Lord take care of everything…something I bank on every day of my life. Meanwhile, as we continue sorting out and interlocking those pieces, we must ask God to give us insight into our experiences so we can better know where it is we should be heading and how best to serve Him, allowing Him to use us to touch every life we come across. The benefits are mutual no doubt; as life can be an echo and gives us back what we give out. To live, as they say, in such a way that those who know us but don’t know God will come to know God because they know us. P Please consider the environment before printing this article.